5. Plan, plan, plan - There's so many articles about content/editorial and social media planning. There's tons of posts in the Facebook groups I frequent about the best schedulers for Twitter and Instagram and someone is always linking their Etsy filled with printable calendars or blogging to-do lists. The importance of planning has become a huge topic that everybody talks about. Even me; I have an entire Truly My Way post dedicated to content planning. It has to be. Have you ever wondered how your favorite blogger has time to write, take pictures, attend events, eat, sleep, breathe? They take the time to plan and schedule content so they can do all these things. Best apps/websites: Hootsuite, BoardBooster, your blogging site's post scheduler. 4. Know when to take a breather - Blogging can be a full-time job. Add that to another full-time job, social life, school, and life can be just about unbearable. When necessary, TAKE A BREAK! If you plan content accordingly then your readers won't even know you're gone. I frequently get burnt out from work and know I should spend time blogging, but just can't seem to find the energy. I don't want to publish any shoddy work so I'd rather just skip a day (or two) and come back refreshed and ready to tackle my to-do lists. 3. Set goals - Why are you blogging? Who is your target audience? What makes your blog different from somebody else's? 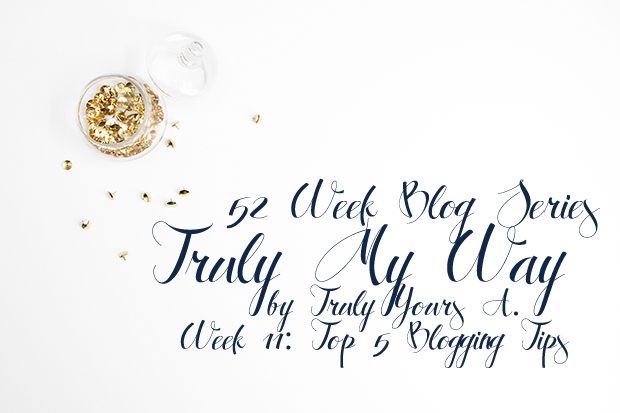 These are all questions I had to answer when I started blogging and these questions helped me establish goals, or something to strive for, for my blog. Without goals, I would be aimlessly blogging with no clear path. Mine are as small as increasing page views to gaining followers or as advanced as gaining enough exposure to be approached by companies to do sponsored posts or attending blog conferences. Bloggers Get Social and The Nectar Collective have great worksheets for mapping out your goals and ways to achieve them! 2. Make friends - Making blogging friends is one of the best parts of blogging. You'll meet tons of people who will understand your struggle with layouts, content, or exposure. We all need people to bounce ideas off of or someone who won't mind taking photos for you (as long as you return the favor!). Blog friends will also keep you accountable for your goals because you won't get the eye rolls or sighs when you mention the word "blog". I haven't found my 'blog tribe' just yet, but I'm hoping to meet people who can help me learn and grow and I can go to whenever I need help. 1. Have fun! - IF you're not having fun, what are you doing? I can honestly say I enjoy taking pictures, writing, scheduling content, posting on Instagram, all of it! If I didn't get some type of enjoyment from doing this, I wouldn't be doing it and the same should be said for you. Not everybody wants to make money from their blogs, sometimes we genuinely enjoy sharing pieces of ourselves with the world. What are some of your favorite blogging tips? Leave them in the comments below!